Shabbychick Junk. : Happy B'day, Bella! So this morning, I'm packing up my stamp stuff to head over to my Aunt Jan's scrapping group in Hudson, WI today. I'm hoping to make a ton of samples to put on my blog, since I'm done with my dirty dozen assignments for the moment! In the meantime, I thought I'd show you guys the card I made for my sister Gina's birthday. She has a tiny yorkie named Kira, so it gave me an excuse to pull out my "Parisbella" stamp from Stamping Bella and use her on Gina's birthday card! Remember I told you guys I have a new obsession? Well I've gotta show you the fun swirls I scored from the Archivers dollar spot. I've been feeling like I always use the same 'ol, same 'ol stuff on my cards, so I was EXCITED to see these chipboard swirls in Archivers hot spot for $1.99 a bag! When you pull them out of the bag they explode, because there's so many in there! I've been painting them and then covering them in glitter and using them on cards! I also have to show you what I did with all of my embellishments. 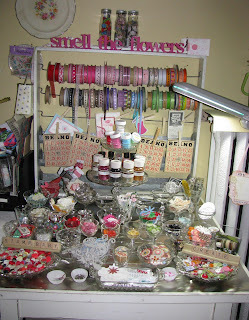 I was inspired by a scrapbook store in Pine City, MN, where they sell embellishments by the piece, like an old candy store! 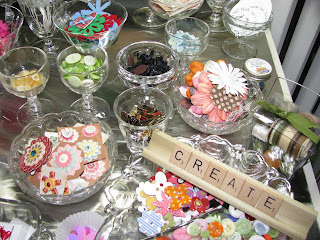 They had glass cookie jars and bowls of fun goodies to purchase one piece at a time! 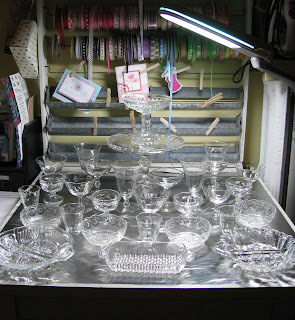 I wanted mine to be on a smaller scale, so I pulled out all of my antique ice cream cups, champagne glasses, compotes and cake plates! I arranged them from tallest to shortest. Then set about pulling all my embellishments from my travel case into the glasses! Here's what it looks like finished! It's so nice to be able to finally see what I had in my stash. I travel a lot with my stamping stuff, so during the summer it has to be portable and easy to grab on the go. But in the winter.....I'm snuggled up at home in my stamp room. And now I can see all of the goodies at a glance! 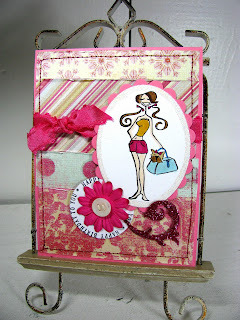 Thank you, Marni, at Pine City Scrapbook Co., for all of your inspiration! Have an inspired Saturday, everyone! What a cute idea! Everything looks so much nicer when displayed in crystal. You must not have any cats, tho. Mine would have a real good time playing with it all and smacking it around! lol! Now that is fun! It all looks like candy. What a fun idea. Wow, what eye candy! Everything looks so luscious. But, knowing me, I would spill everything! Love how it looks all displayed in the open. I LOVE your ribbon holder--what is that? Did you make that or was it some lucky junkin' find? I love all your embellishments in the crystal! How fun!! Oh man, I wish I was back in that room taking in all your pretties! It looks so inspiring LZ! Love your sisters card too, Happy Birthday to sister Zappa!! Your card is Fantastic!! 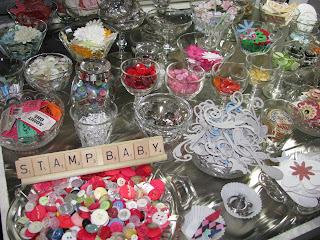 I LOVE all of your embellishments in crystal-it all looks soooo yummy!! I also love being able to have stuff out where I can see everything. I would love to see more pictures of your room! 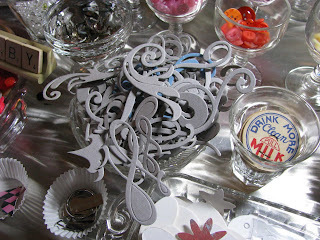 That is awesome Lisa...I am such a klutz I would end up knocking them over and crying over my spilt embellishments! !